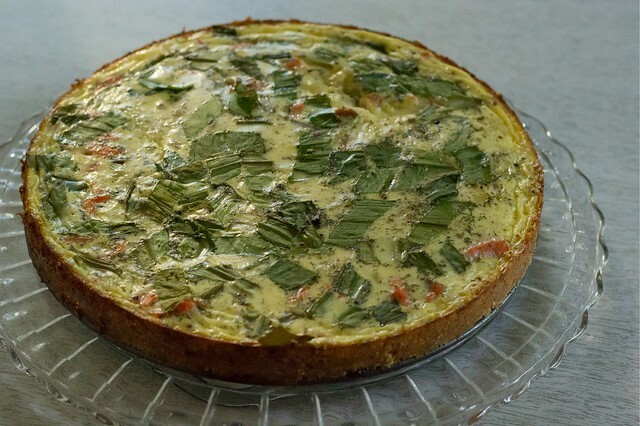 Food Update, Smoked Salmon & Ramp Tart. Where does the time go? I feel as if I barely look at the Internet anymore, rarely read the blogs that I once read voraciously and with total vigor. I have slipped back into the old fashioned habit of cookbook reading from front to back (or did I never really abandon that notion? ), devouring the written word the way God intended: inscribed into a tangible medium. When I do have time to make the Internet rounds, I find that other people are likely as busy as I am. A handful of people I checked up on recently haven't been posting in several months, perhaps now their blogs are even defunct. Others are busy with other work and are posting less seldom. It bothers me that I don't make the time to sit in the glow of the computer and update what has been going on in my own personal world of food - especially since I've feel so happy in my kitchen lately. My kitchen was painted in late March, and when cleaning it out, (it was off limits for 5 days when ceilings/walls were repaired before painting) I reduced my clutter. I was lucky to get a new fridge a couple weeks ago when my old one was keeping things at a balmy 60 degrees. The new one is larger inside but almost seems smaller outside, and I took the opportunity to cleanse it of years old condiments: preserved kumquats from 2011? Imported capers packed in salt that expired in 2011? Both were probably still fine to consume, but it feels so good to be lighter. It feels so good not to re-clutter the fridge, enjoy the bright light through the new shelves when I open the doors. The new fridge causes me to cook less, too. What's that? Cook less? Probably because I am more in tune with the leftovers and I re-create things using them without needlessly making more. Believe it or not, I notice a difference in my food budget too. Being creative on what seems to be an empty fridge - but really it's never been more full. I vow not to make more condiments before I actually run out this time. Craving smoked salmon, I picked up an 8 oz. 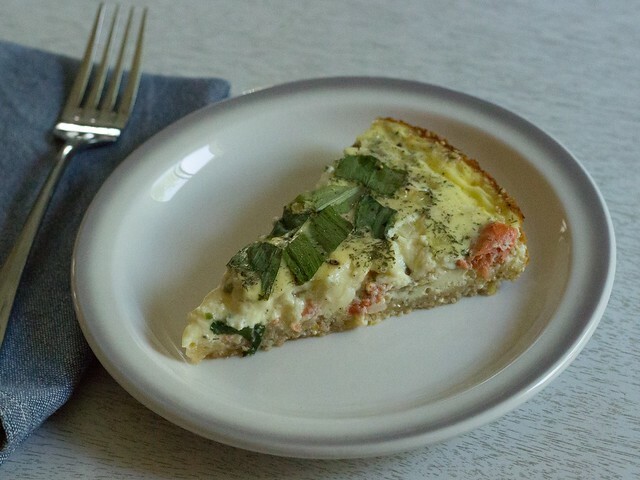 package a couple weeks ago and somehow decided on making Megan Gordon's smoked salmon tart with a remarkable cornmeal and millet crust. It was so good I made it two weeks in a row, but adding more ramps than I did in the first rendition. One thing I noticed this year above other years is just how long ramp season is. Being a teacher caused me to spend more time outside and in the woods, and what I thought was really a fleeting 7-10 days of a season really stretches the better part of a month or more. 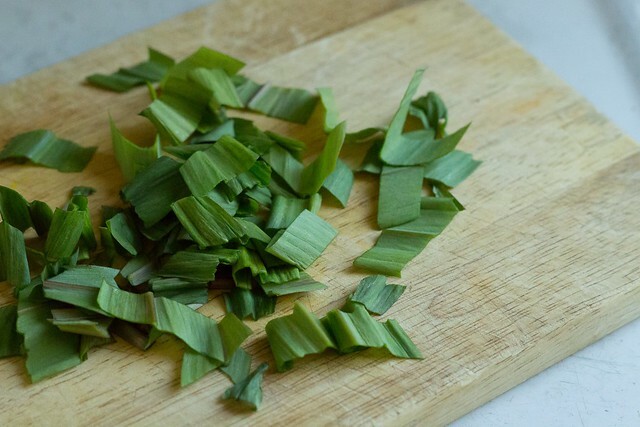 I spent the days of ramps well, but not overdoing it... adding a single one here or there for a twist, eating really good soft cooked scrambled eggs with them butter-sauteed inside. Maybe a month ago or longer already, I came across the TeamYogurt site after a friend pinned this brilliant Nutmeg Crunch. I felt so out of the loop. AND totally inspired to make heat-set yogurt again after a very long hiatus. My room temp culture had conveniently just died, so I figured I didn't have much to lose using a store bought Greek yogurt as a culture. I read an article on the National Center for Home Food Preservation site that recommended heating the milk to 200 degrees and holding it there for 20 minutes before cooling and then culturing for 7 hours. I've streamlined my process now, and it doesn't take me all that long now that I've got the hang of it again. I heat my milk to between 185-200 in a makeshift double boiler, hold it for 10 minutes, and then cool it rapidly (it only takes 5 minutes) by pouring the hot milk into the bowl I'll culture it in. Then I sink that bowl into a larger bowl of ice water and stir it infrequently for 5 minutes. It seems like a mess of bowls and timing, but it is easier done than said, and by the time I'm putting the cultured milk into the dehydrator to keep warm I'm nearly done with the clean up. 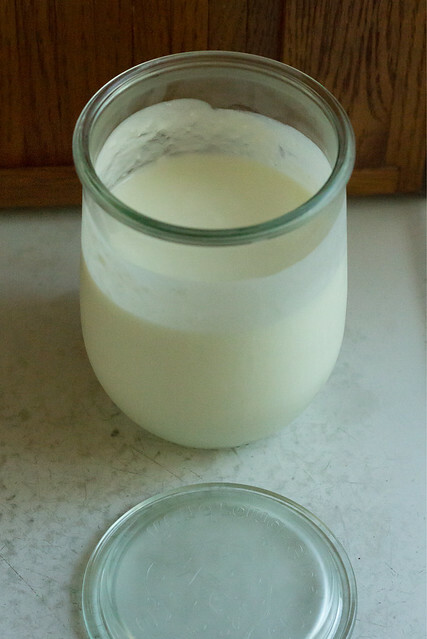 My yogurt has a gorgeous flavor now that it's several generations old - and a velvety buttermilk texture. I used it in the salmon tart. Megan Gordon wrote this recipe using creme fraiche, which is also easy to make, but in the spirit of using what I have I used the yogurt. I love the texture of this tart so much. It keeps well for a few days for lunches and the ratio is sound for pretty much any ingredient you would want to add. Err on the shorter side of baking for a more custardy interior, but bake fully if you intend to pack for lunch or picnic. And if you still spy a few ramps, by all means use them in their entirety. The tart crust is just perfect. With the additional of a couple tablespoons of confectioner's sugar, I really want to make it as a base for a lemon curd. In my experience, you can never go wrong with millet! I appreciated that her book Whole Grain Mornings was written in weights, and I made the crust using them. Her conventional measurements are also below. 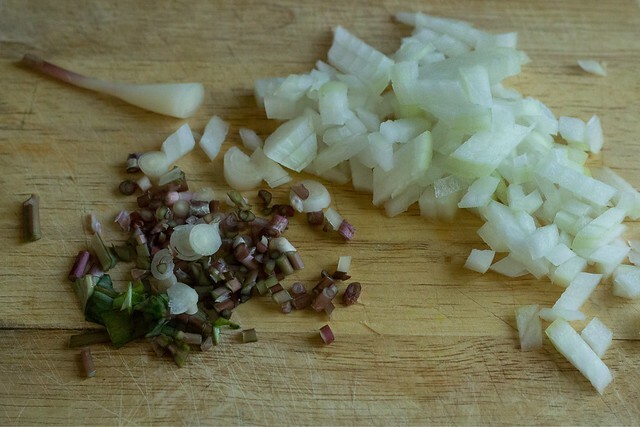 If you don't have ramps, make this with onions and add a clove or two of minced garlic with the onions of your choice. Butter a 9 inch tart pan (or springform pan, like I used) well and set aside. In a food processor, pulse the cornmeal, wheat flour, and salt together to blend. Add bits of butter and pulse several one-second pulses until it resembles a coarse meal with bits of visible butter. Add the ice water 1 tablespoon at a time and pulse until the dough starts to hold together when you pinch it. Add the millet and pulse 2 times more to evenly distribute it. Transfer it to the buttered pan and press it evenly into the bottom and up the sides. Cover it, and place in the fridge to chill for 1 hour and up to a day. After your crust has chilled and you're ready to bake your tart, preheat the oven to 375. Remove the chilled tart base from the fridge and place on a sheet pan. Pre-bake it for 15 minutes just to dry out the top a little bit. Meanwhile saute the chopped ramps (reserve the leafy ribbons separately) and onions in a little olive oil until just wilted and soft - 5 minutes or so. Beat the milk, eggs, and yogurt with the dill, salt, and pepper until well combined. Spread the onions evenly over pre-baked base , then scatter the salmon pieces over evenly. Pour the eggy custard over the top and sprinkle with the ramp ribbons and more pepper if you think it needs it. Bake in the center of the oven for 30-40 minutes, until the top is set and browned to your liking. This recipe is a keeper for so many reasons, the least of which is the absolute ease with which it comes together. It looks complicated, and it's not. It's the perfect all-in-one food. It's vegetarian without being laden with cheese. It's equally good for breakfast, lunch, or dinner. It's exactly the type of thing that would fit nicely into the "Genius" category that I'm also so fond of lately.